Hoylake Cottage Hospital in Wirral is celebrating 100 years of caring for local people. 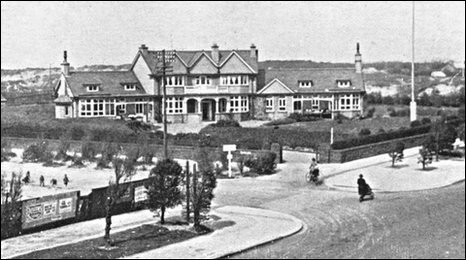 The hospital was first opened in June 1910 by a group of local people as at that time the nearest hospital to Wirral was in Liverpool. The hospital has had a rocky history and faced closure several times after financial problems. 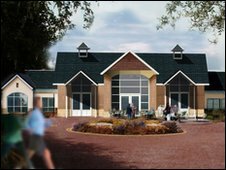 Today the hospital offers 24 hour care for patients with dementia and plans for a new building have been unveiled. Chief Executive Lin Cooke told BBC Radio Merseyside how local people raised money to save the hospital from closure in the 1980s. "Hoylake Cottage was well thought of in the community and they did dig deep and they raised a lot of money and convinced the NHS to give them back the property to open up the building again as a local community hospital. "The local community continue to support the staff and the volunteers because they love the hospital and they service it provides." The hospital has always been supported by local people who originally grouped together in 1899 to form a district nursing committee who appointed the first Queen Victoria District Nurse. In 1906 a temporary hospital with six beds was opened in a rented house in Church Road, now Trinity Road. Four years later in 1910 the 16 bed hospital opened with an official ceremony by Lord Derby in 1912. A shortfall in funds meant that it would be two years before the main male ward would be opened. The district nurse and the hospital relied on the local community for support and funds and local residents paid an annual subscription of £5 which entitled them to four weeks treatment. As demands grew the hospital expanded. In 1925 the 'shilling fund' was started and raised £14,018. By 1928 the hospital was expanded on both sides and had 28 beds with a further eight beds in verandahs and sunrooms. 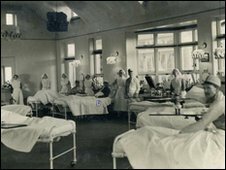 The hospital now treated out patients, had an x-ray department and nurses accommodation. Former matron Edith Wase wrote in a letter to the Wirral News, "I went there in 1922 to take charge on night duty after I had finished my training at the Royal Salop Infirmary. It was a very busy hospital, mostly surgical, and the surgery was done by leading Liverpool surgeons. It was maintained by voluntary contributions." In 1948 the NHS was established and Hoylake Cottage Hospital, along with the country's many other voluntary hospitals, became part of the public sector. An extension was built in 1959 which housed a physiotherapy department and an outpatients department. 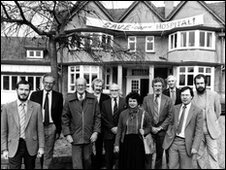 In 1983 the government cut health funds and Hoylake was one of many of the cottage hospitals to be closed. There was much outrage at the planned closure and the 'Save Our Hospital' campaign was launched. The plan was to reopen as a voluntary hospital, as in the pre-NHS years, with funding from contributions, fundraising and grants. The chairman of Mersey Regional Health Authority, Don Wilson, pledged sponsorship for six beds and the district health authority agreed to hand over the building and its contents for a two year trial period. A charitable trust was established to run the hospital and fundraising began. In 1984 the hospital reopened with 22 inpatients and six day care beds, physiotherapy, occupational therapy, x-ray and chiropody. The old outpatients department became the Sandhills Unit providing day care for the elderly mentally ill and the Cottagers Club which offered day care for the elderly. In the late 1980s the hospital ran in to financial problems and went into administration. The combined efforts of management staff, trustees and volunteers saved the hospital from closing for a second time, the charity shop which opened in 1985 played a key role. In 1989 the nursing home inspectorate visited and told it had to modernise and develop single bed, ensuite accommodation. This started the Building Beds Appeal. By 2001 it was agreed that the old hospital did not meet current care standards and plans to create a new 60 bed three storey building were announced. In 2008 Southworth House opened and for the first time Hoylake Cottage was able to offer a 24 hour nursing service to residents with dementia, long with 24 hour general nursing, respite and day care. Plans have been unveiled for the new, purpose designed day care centre at Hoylake Cottage with social activities and day rooms opening onto landscaped gardens. The current 'Buy a Brick' campaign, where people cam dedicate engraved bricks in the new building, hopes to raise money to continue Hoylake Cottage's role in the local community.